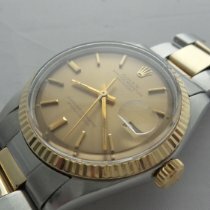 1968 Vintage Rolex Datejust Ref. 1601 with Newer Rolex Replacement 18k White Gold Rolex Fluted Bezel and Stainless Steel watch with Silver Dial with Applied Steel Stick/Bar/Baton Markers. Triple Signed.